The party has vowed to renew and strengthen state institutions and propel the economy towards a higher growth trajectory, Fikile Mbalula says. The ANC plans to continue selling itself on the ticket of being a party of the poor, a champion of women and youth and a leader of socio-economic transformation, with job creation a priority. The party has vowed to renew and strengthen state institutions and propel the economy towards a higher growth trajectory. It will lean on the stimulus and recovery plan announced by President Cyril Ramaphosa and the Framework Agreement reached at the recent Jobs Summit. 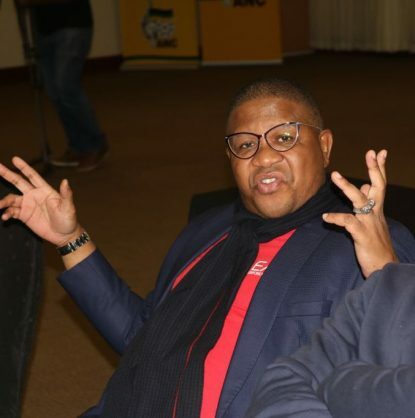 This emerged yesterday as ANC head of elections Fikile Mbalula unveiled a countrywide consultation process into the drafting of its Ramaphosa-led “People’s Manifesto” that will focus on societal challenges. Mbalula said the document would enliven the party’s 54th national conference resolutions. An objective was to broaden and deepen participation in the manifesto process by what he termed “strategic sectors of society”. He said they would “demonstrate that the ANC was open and willing to listen and engage on key issues affecting the country and develop relevant political and socio-economic policies to address them”. According to Mbalula, the manifesto will be officially launched at the ANC’s 107th anniversary rally on January 8. It will aim to develop common understanding and identify possible solutions to current challenges, contradictions and constraints South Africans faced. “The 54th National Conference urged us to renew our commitment to radical socio-economic transformation so we deepen the process of change. Our conference also entrusted us with the tasks of championing the issues concerning women and youth,” he said. They will prioritise women’s empowerment because women constituted more than half of the population, while young people, as the majority of the population, must become the “drivers of our transformation agenda”. Through its manifesto consultation process, which began in June, various stakeholders voiced confidence in the party, but the youth insisted the ANC must be decisive in dealing with the negatives that had characterised it recently. “Young people have also spoken loudly and want to see the ANC infusing dynamism to its character,” Mbalula said. Ramaphosa insisted the manifesto must be based on the needs of the people and be gleaned from their views at grassroots level. He said the “People’s Manifesto” must give effect to the view that South Africans were active agents of their own liberation. The ANC plan came at a time when the government faced criticism for failing to deliver services to the people and over rampant corruption in public institutions.